Wisconsinites are a proud lot. Not only proud, but truly unique in our existence. Eau Claire’s Matt and Suzie Kendziera of the band honeyTree have found a way to highlight our quirky sense of pride and lifestyle by sharing the experiences of Wisconsinites, their love of music, and expertise in performances with their upcoming show at Fanny Hill, Wayside. The two describe the show this way: “Prairie Home Companion meets Whad’ya Know? combined with Let’s Make a Deal and a focus on all things Wisconsin and you have Wayside.” As the title suggests, road trips are often defined by the journey and the stops along the way rather than the destination itself. Wayside will focus on this idea as well as a Wisconsin setting. What Wisconsinite isn’t looking for an excuse to bask in the awesomeness of our own culture? Wayside is a perfect, fun, musical excuse to do just that. About two years ago, the Kendzieras were driving around Washburn after a family camping trip and were inspired by the nature they saw around them. In combination with catching a show at the Big Top Chautauqua and thinking about how much they enjoyed doing Christmas variety shows, ideas started flowing about creating a Wisconsin-themed variety show. Playful notions were tossed back and forth until a wayside was passed and a potential title was born. Suzie shares, “We really do love Wisconsin and bringing people together and music, so it’s a great fit for us.” Music is at the core of Wayside, but the show also includes comedic, true (exaggerated) storytelling, and relies heavily on audience participation. 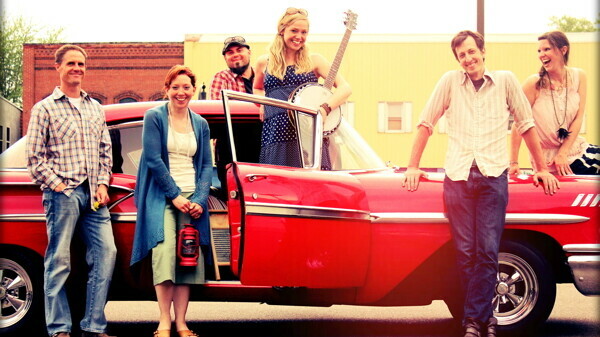 Matt and Suzie’s band, honeyTree, which includes Kat Sherman, Ryan Sherman, Keri White, and Chad White, is the house band and all the music was written by either Suzie or Keri. At certain points, members of the band will enter the audience (Let’s Make a Deal style), drawing audience members into the show and even offering local prizes to willing participants. Another portion of the show plays off the sometimes obnoxious “road trip mom” who is always trying to instigate car singalongs. The negative things in life are often what get the most attention, but Matt and Suzie argue that there are more positive things that we simply don’t notice, and if Wayside can be a place where people are reminded that life is really good, that would be “really beautiful and victorious” for them. The words Matt and Suzie used to describe Wayside include, “playful, spontaneous, relaxing, interactive, and inspiring.” I’m sure Wayside will instill a positive attitude in its viewers and leave them feeling happy. If you’re looking for an exciting way to embrace your Wisconsin pride and see some amazing performers all at once, this is the perfect show to see. Wayside will run at Fanny Hill, 3919 Crescent Ave., at 8pm Friday and Saturday, July 5-6. Tickets are $15. Dinner is available for an additional cost with suggested dining times between 5:30 and 6:45pm. Drinks, appetizers, and desserts are also available. Call 715-836-8184 for reservations.